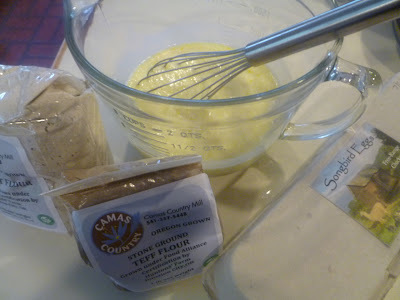 In anticipation of a house guest on a gluten-free diet, I had stocked up on some wheat alternatives from Camas Country Mill: buckwheat and teff flour. It's important to note that because these grains were processed in a mill that also processes wheat, they are not suitable for someone with a severe gluten intolerance. For local grain enthusiasts in need of strict gluten-free grains, the Willamette Seed and Grain Project in Tangent is planning a gluten-free mill. Last weekend I experimented with gluten-free waffles. Waffles are a favorite weekend breakfast in our household (doesn't everyone have a Belgium waffle maker, since it lies at the perfect sweet spot in the wedding gift spectrum between too stingy and too extravagant?). Lately I've been feeling a little bored with the standard white flour variety. These teff and buckwheat variants are still light and airy, but with a much more distinctive flavor. 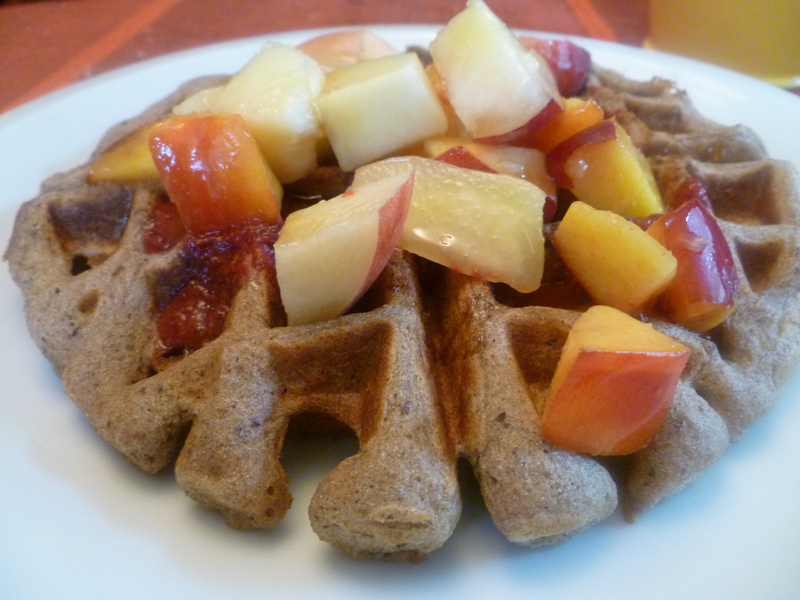 With the heft from the teff and hint of sourness from the buckwheat, these waffles are a delicious receptacle for sweet fresh fruit, such as berries and diced peaches. 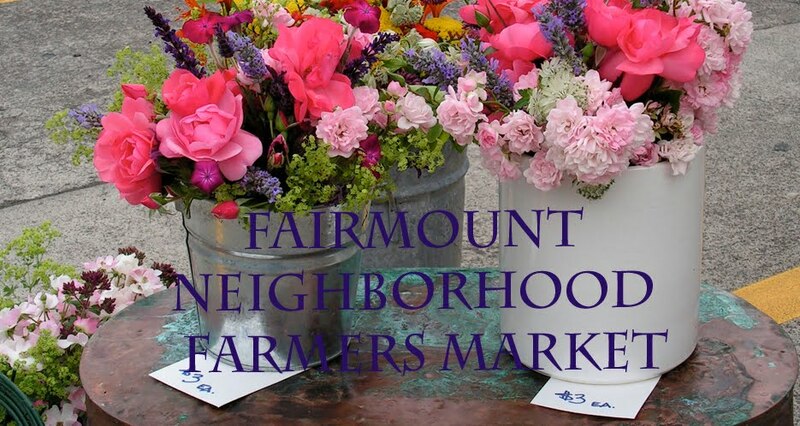 We had recently gone strawberry picking at Evonuk’s on Seavey Loop, but gotten sidetracked with a picnic at Mount Pisgah, and by the time we got home, most of the strawberries were half baked. 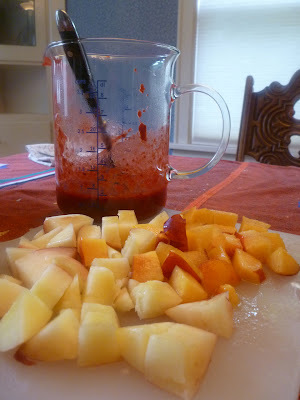 To salvage the mushiest, we pureed them in the blender and frozen the strawberry sauce in small ziplock bags, which proved to be a perfect aliquot for drizzling on waffles, along with a splash of maple syrup. We'll definitely be making these waffles again, even without the excuse of a gluten-free guest. 1. Mix together the buttermilk, egg yokes, and oil. 2. 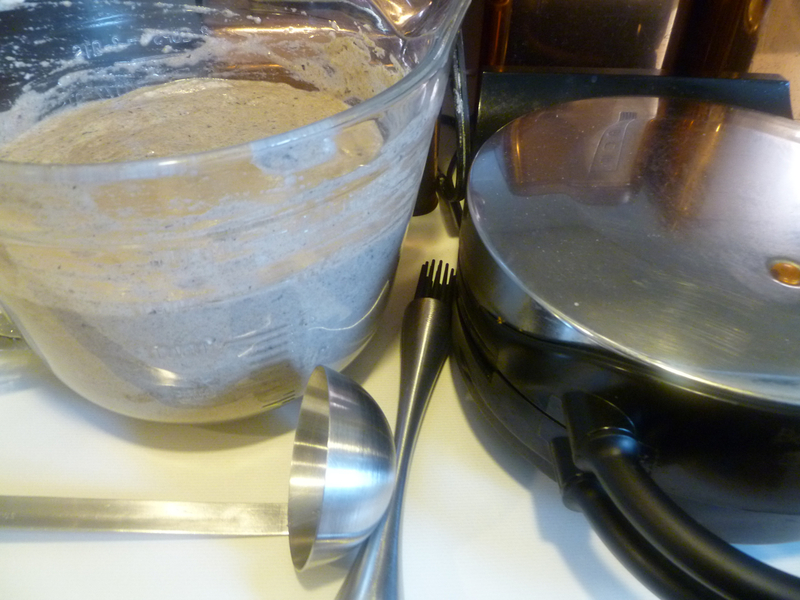 In a separate bowl, mix together the flours, sugar, baking powder, and salt. 3. Beat the egg whites into stiff peeks. 4. Gently mix the dry ingredients into the wet. Fold in the egg whites. 5. Heat a waffle iron and grease with a little butter. Ladle in batter and cook waffle. Serve warm with fresh fruit and maple syrup. Makes about 5 waffles.